A NEW movement being spearheaded by former Greek finance minister Yanis Varoufakis is vowing to shake up the cosy Brussels elite and threaten the jobs of euro bigwigs like Jean-Claude Juncker. Diem25, a pro-democracy group which was set up 18 months ago, is now considering putting forward candidates for the European Parliament elections in 2019 to help shape the EU agenda. This is despite the fact members of the movement, including Mr Varoufakis, have been scathing of the institution which they do not consider to be a proper legislative chamber. The left-wing group describes itself as pro-European but frustrated with the sclerotic and undemocratic processes of the EU, which it wants to see radically reformed. 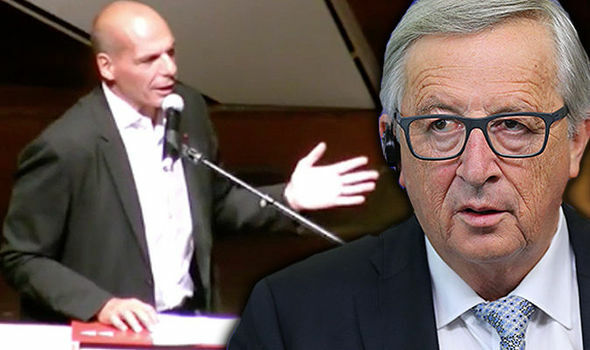 Mr Varoufakis, its most high-profile figure, is preparing to overshadow Mr Juncker’s flagship State of the Union speech on Wednesday with his own proposals for the future of the bloc. In an outspoken intervention he said part of the reason for the club’s malaise was that EU fatcats are now too comfortable in their highly paid roles, from which they know they can effectively never be ousted. And he was derisive about the EU Parliament, describing it as a powerless fig lead to democracy and “the only parliament in human history that cannot initiate legislation”. There are 751 MEPs who are all paid a basic salary of £92,400 which is topped up by very generous expenses, a £275 daily allowance, tax breaks and lavish pension contributions. But it is only the EU Commission, which is staffed by unelected officials, that can propose new laws – although it does so based on the priorities laid down by the elected leaders of the 28 member states. The EU Parliament then effectively acts as a revising chamber, scrutinising and tabling amendments to the Commission’s proposals. Although MEPs do have a veto on all suggested laws, they very rarely use it. This contrasts starkly with most democratic systems such as the UK’s, where the executive that puts forward the legislative programme is a Government made up of ministers who were directly elected as MPs. Mr Varoufakis has been extremely critical of the EU’s democratic processes ever since his own experience of negotiating with the bloc over the terms of his country’s bailout deal in 2015. In its manifesto, Diem25 accuses the “powers of Europe”, including the EU Commission, of “speaking in democracy’s name but only to deny, exorcise and suppress it in practice”. It says the bloc’s “nightmare” bureaucracy “seeks to co-opt, evade, corrupt, mystify, usurp and manipulate democracy in order to break its energy and arrest its possibilities”. Mr Varoufakis has repeatedly warned British negotiators that they have walked into a “trap” over Brexit, and has said his experience of the EU is that it is impossible to negotiate with.